I was sitting with a group of people once, all from different countries, and we were comparing languages. We decided that Spanish started out easy, and never really got too complicated. French, on the other hand, started out very had, but if stayed with it, it got easy after a while. German started off difficult, and stayed difficult, and Russian started off hard, and just got harder. English, we all agreed, started off very easy. A German friend of mine said he got by for three months using just a few nouns and verbs and the word “get.’ He could get a hotel room, get some food, get to the next city, get some sleep, and get away. But eventually English got impossible. For example, look at the following words. Today I want to talk to about something else that starts off sounding easy, but gets impossible to understand pretty quickly and that is the Christian Doctrine of the Trinity. 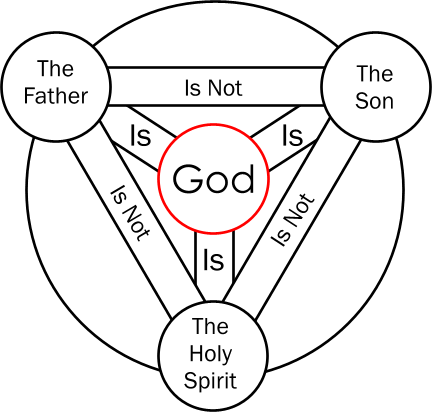 On the one hand, the Trinity is simply the idea that God appears as Father, Son and Holy Ghost. We get that, obviously from the Bible, where we read about God the Father, God’s Son, Jesus, and the Holy Spirit. The Trinity is all over the Bible, even in Genesis, which we heard today. When I was an undergraduate, a Muslim once asked me to explain the Trinity to him, and after our conversation it was hard to tell who was more confused—me or him. The more I tried to explain it, the less I understood. He had some good questions, but I didn’t have any good answers. Does this mean there are three Gods? No. There is only one God, but one God in three persons. Throughout the history of the early church, as they tried to explain the Trinity, they ran into more and more problems, many of which we still run into today. The Trinity is like water; you have ice, you have water and you have steam. That works a little bit, except that we have a hard time thinking of water as a solid, a liquid, and a gas all at the same time. 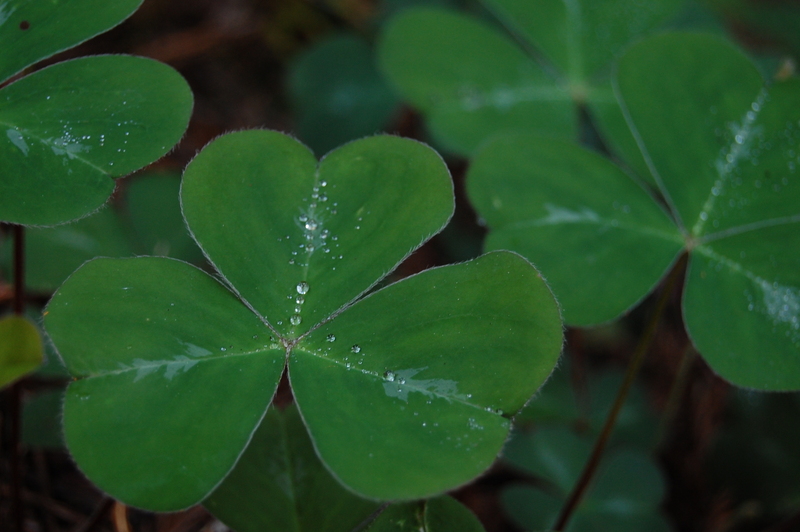 You can think of a shamrock, which is often the symbol of the Trinity, however all the leaves are the same, and theologians were insistent there was a difference between the Father and the Son and the Holy Spirit. In the end, all the theologians could really say was this. The Bible speaks of the Father, The Son and the Holy Spirit. They are different persons, yet one God. If you look at this slide, you see what I mean. Theologian waxed long and eloquently about the Trinity, and it is, I believe, one of the most sublime doctrines of the history of Christianity, perhaps in the History of religion. One distinction theologians made in their musings was the difference between theoretical and practical doctrines of the Trinity, and this morning I am going to steer clear of the theoretical and focus on the practical doctrines of the Trinity. Are there practical implications to the doctrine of the Trinity? I think there are, and wouldn’t you know it, I came up with three practical implications. And this is my first point. It would be nice to worship a God we could completely understand, but the fact is, I don’t completely understand my wife or my children, the people I am closest to in the world, so why would I think I should be able to completely understand the nature of God? The Trinity is a reminder that God is infinitely more complicated than we can imagine. Too often we think we have a handle on God, and that is far from the reality of the situation. In fact as Christians we do not claim to have a handle of God—quite the contrary. Instead we recognize that God has a handle on us. A person who thinks they have figured God out is a dangerous person. In fact, if there is any truth to the Trinity, they are deluding themselves. What they have a handle on is THEIR IDEAS about who and what God should be. That is often a very different thing from who God really is. Instead of worshipping God, I am worshiping something that I made up, a pigment of my own fascination. And the fact is, I can make a pigment of my own fascination be anything I want it to be. I can make God back up and all of my own opinions. I can make my god a left-wing democrat, or a right-wing republican. I can make my god a tree-hugging, Birkenstock wearing, Prius driving, bleeding heart liberal socialist. Or I can make my god a gun-toting, gay-bashing, Obama hating, pro-life, tax cutting, free market libertarian. But in fact God is not like either of those caricatures, and if you ever see the triune God identified with any political party or philosophy, any economic system or philosophy, any nationality or racial group, or for that matter any one denomination or Christian subset, then you know someone is trying to use God for their own purposes, and they are not worshiping the Triune God. We don’t get a handle on the Triune God. The Triune God gets a handle on us. But the true God, the Triune God of Christianity is much, much more complicated than that. The Trinity reminds us that if we think we have God down, we are sadly mistaken. Second, The Trinity is about variety. God is not Just One Thing. While there is a deep unity within the Trinity, there is also a variety, a diversity. Within God’s own nature, God does not look the same. The Father is NOT the Son and the Son is NOT the Spirit. If there can be diversity within the very nature of God, can we not then accept diversity within our churches? And thirdly, the essence of God is personality and relationships. God is not a force, not a vague power, not a ground of being. When the early Church fathers were discussing the doctrine of the Trinity, they very carefully used the word “person” when referring to the three different parts. When we speak of the Triune God, we are speaking of a relationship between the divine beings. They only exist as they exist in relationship. We get this from the very beginning of the Bible, as we heard this morning: Genesis 1:26 Then God said, “Let us make humankind in our image, according to our likeness; and when we were created, 27So God created humankind in the image of God, in the image of God they were created; male and female God created them. One of the overriding convictions of the early theologians of the Trinity was that in order to be a person, you have to be in relationship. To quote John Donne, no man is an island. Now that is exactly how the movie About a Boy starts. The main character, Will, says that he is an island, he does not need anyone else in his life. He is independently wealthy, so he does not have to work, he is young and good looking, so he has a series of romantic relationships, none of the serious or long lasting, and he has no real family to speak of. He is an island. But occasionally he wants other people on his island. Through a series of funny and strange circumstances, a young boy, Marcus comes into his life. Marcus is the school outcast, the kid everybody makes fun of, and he ends up coming over to Will’s apartment after school everyday to watch TV with Will. At first they are just watching TV together, but then Marcus starts to grow on Will. He buys him some cool shoes, and Marcus invites Will to have Christmas with he and his mom. Will goes, and has a surprisingly fun time. Soon after that, Will meets a woman, Rachel at a New Year’s Eve party, and is very interested in her. When he first meets her, he tries to strike up a conversation, and she asks what he does for a living. Will says he does nothing. She asks what he did before he did nothing, and Will says, “the interesting thing about me is that I don’t do anything.” Well Rachel turns away to talk to someone else, clearly not interested, and says something about rap music to the other person. Will is desparate for her attention, and says, “I know a twelve year old who would disagree with you on that.” Rachel says, “I have a 12 year old too. What is the name of yours?” and Will says, “Marcus.” Now Will has to pass off Marcus as his son. It works for a while, but finally Will confesses to Rachel that Marcus is not really his son, and that they are not even related. And Will says, “That’s all I am. A blank.” He recognized that he was an island, but he was not really a person. Soon after that Marcus runs into problems, and Will realizes that he lost Rachel, who he loved, but that he also cares for Marcus, and he makes some great sacrifices for Marcus. He comes off his island. He becomes a person. God only exists in relationship. The Trinity is a relationship between the Father, the Son and the Holy Spirit. Some theologians have said that the Spirits arises from the relationships between the Father and the Son. I don’t know about that, but I know that the essence of God is a series of relationships. For us that means two things. First, that God desires a relationship with us. Think of all the things you might think God wants from you.—obedience, service, to be a good person, to do good to others, to go to church regularly, to worship, to read the Bible. The list can on and on. But what God really requires of you is a relationship. God wants to know you. And God wants you to know God, as much as you are able. The second thing is that we are created in the image of God, and we are created for relationships. We are created to be with others, to love others, to care for others, and to be cared for by others. We were made to be in relationship. This entry was posted in Church, Jesus, Trinity. Bookmark the permalink. The New Testament speaks of the Father and of the Son and of the Holy Spirit. Many have understood this to mean that God is in three Divine Persons, each of whom is infinite and eternal, and each of whom is God and Lord. But the New Testament does not speak of Persons in God at all, much less of three Divine Persons existing from eternity. It is admitted by many that the question of how three persons make one God is past all human understanding. And because of this mystery many people do not think deeply about God, believing that their minds are not capable of entering into such thought. What does Swedenborg teach concerning the Divine Trinity? From what has gone before in this lecture it can be seen that the Father, the one infinite and eternal God, is not one Divine Person and the Son another Divine Person. but that they are one. as soul and body are one. The Son. the Divine Human, is the Divine Body, and the Father is the Divine Soul in that Divine Bodv. Even as the soul and body of a man are not two people, but one person, so the Father and the Son, the Divine and the Divine Human of the Lord are one Divine Person. But what then of the Holy Spirit? This was said after the Lord’s Resurrection. The Holy Spirit is there represented as the Breath of the Lord. His Breath is His Divine Truth going forth from Himself to men. Swedenborg calls this the Divine Proceeding, or, the Divine Operation. After the Lord was glorified, that is, after His Human was made Divine, the Comforter, the Holy Spirit, which leads men into all truth, could come to men, because through the Divine Human the Divine Good and Truth can inflow into our minds. The conclusion therefore is that the Divine Trinity is not a Trinity of Persons, but that it is a Trinity of essentials in the one Divine Person, our Lord Jesus Christ. The Father is the Divine itself, present in Him as the Soul. The Son is the Divine Human, which is the Body of that Divine Soul, and the Holy Spirit is the Divine Operation, the Divine Good and Truth proceeding from God to men. If you see God as one Divine Person, one Divine Man, and the Trinity in Him as Soul, Body and Proceeding, you will have an understandable idea of God and of the Divine Trinity in Him. This teaching is that which is given in the Old Testament and in the New Testament. It is the Supreme Truth concerning the Lord. This truth may be summarized thus: That the Lord Jesus Christ is the one God of heaven and earth, that He is Jehovah, the Lord from eternity, that He is the Creator from eternity, that He is the Redeemer in time, that He is the regenerator into eternity, and thus that He is at the same time the Father, and the Son and the Holy Spirit. The Lord Jesus Christ is our God. There is no other. To Him we owe all that is good and all that is true. All power in heaven and on earth is His. To Him alone should we pray. To Him alone should be our worship, our love, and the service of our lives.